In my opinion these are great photo’s to look at before having any smp work done. 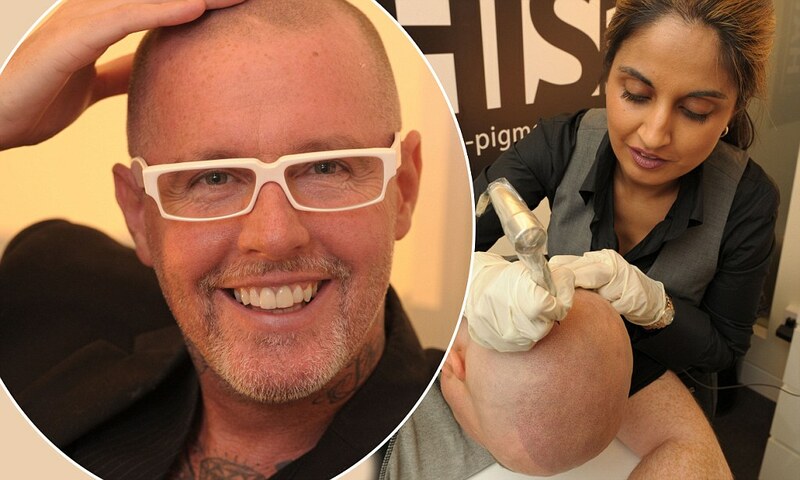 Now there’s a cure set to save them money and heartache - by tattooing ‘hair’ on. Thanks for sharing the link hairdar, but I still don’t agree that permanent smp is in the patient’s best interest. Agreed. Having scalp tattooed on a permanent basis is scary. Have seen quite a few patients with permanent tattoos. That is why I think one needs to be cautious and do a thorough research. The ideal situation I would recommend is for a patient with extensive hair loss, limited donor - and even there it should be a mix of HT and temporary pigmentation (not the permanent one). We should be careful to note, before calling the results hideous, that the guy in the middle has almost certainly just come out of his procedure (hence the red scalp) and shouldn’t be used to judge the procedure. It’s obviously a poor choice for a publicity piece. I don’t like the hairline of the guy on the left at all (it seems awfully low), but the guy on the right looks fine to me. I probably wouldn’t have noticed that anything was amiss as all with their hair if I didn’t know already. I do wonder what these look like in person. I don’t think they look hideous, maybe because I have seen SMP photos before, the photos in the newspaper article didn’t shock me. I’d like to see them in person too. They look like mental patients. No HT doctor would ever even transplant hairlines in this shape for people at those different ages. Yes, they don’t look good - goodness knows how bad they might look in person. I agree with you skywalker. The best use is in conjunction with a hair transplant using temporary pigments. Working at Dr. Cole’s office, I have seen some SMP work and the appearance of every one I have seen is simply not acceptable in any way whatsoever. Remember, doctors placed 4mm plugs for something like 30 years even though they looked like hell. Men losing their hair are often desperate and they get taken advantage of. I get tired of seeing those crappy SMP hairlines produced by technicians posing as artists who have no business whatsoever placing a mark on anyone’s head. I would be so embarrassed sporting one of those tattoo jobs in public. We recently fixed one that was first partially lasered because the incompetent placed the hairline too low. The area of skin that was lasered lost some pigment leaving a white band across the patient’s forehead. We camouflaged the huge dots with transplanted hair. I agree with you on some aspects. But one has to understand, and I am sure you would, that just like all HT is not the same…similarly all SMP is not the same. That is why it is important for responsible HT doctors and potential patients to do their research properly.